Now that the sweater and insulated jacket have regained their spots as wardrobe necessities, there’s no denying it—the season of barbeques, mojitos, and daiquiris has officially ended. But not to worry! As the temperature plummets, we can kick up the heat with one of the year’s tastiest drinks—hot chocolate. As I found myself with numb fingers and a sweet tooth a few nights ago, I realized that there’s only one proper solution for a cold/hungry combo this time of year, and of course, it’s cocoa. I sat with my friend and long-time roommate, Jackie, in the living room of what once was our shared apartment and sprung the idea on her. Want me to make some hot chocolate? Jackie laughed at first and declined—she would go get herself a glass of her signature Sweet Tea Vodka cocktail instead. A little alcohol during our catch-up conversations was always welcome, if not expected. What if I make cocktails? 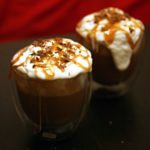 Hot chocolate cocktails. With ice cream. And caramel. And just like that, I was given the go-ahead to get my hot chocolate fix, and was told to make enough to share. Who could turn down hot chocolate, alcohol, ice cream, and caramel? Not I. Not she. So after a quick trip to the liquor store, I made my concoction. Would it taste as good as it sounded? The first time, no. I put far too much alcohol in, which resulted in an extremely bitter drink. But the second time? The second time I wound up with a drink which will be recreated on many a winter’s night to come—the Adult Salted Caramel Hot Chocolate Float. Salted caramel. Hot chocolate. Ice cream. Alcohol… Am I in heaven? Fill the remainder of the cup halfway with hot chocolate. Add a scoop of vanilla ice cream, drizzle with caramel sauce, and add chocolate shavings and a light sprinkle of sea salt. Enjoy! *If you are using a glass, make sure it is a double walled thermo glass, so your drink stays hot, you don’t burn your hands, and the glass doesn’t shatter. I used Bodum Pavina 8 oz Glasses, but I recommend bigger ones (so you can fit more drink, of course)! Sounds delicious…and very possible to make at home (especially for someone who does not cook…at all)!